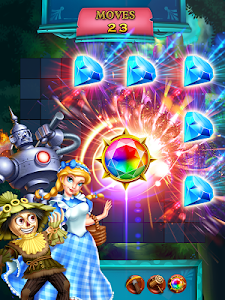 jewels star: OZ adventure is free, just play and enjoy for fun. We have many cute and beautiful jewels, diamond, with easy to use controls, simple and friendly graphics. Enjoy the Arcade mode with more 300 stunning levels and the Classic mode which is completely Endless jewels star: OZ adventure mode. 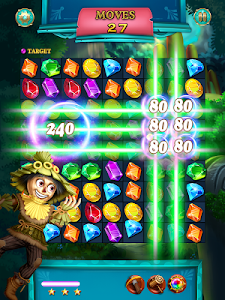 jewels star: OZ adventure will provide you a very funny and challenging time. ☆ swap and match jewels in group of three. ☆ less moves you pass a level, higher score you'll get. Try to score high and earn 3 stars on every level. ☆ match 3 or more identical jewels. ☆ make the jewel star down to the last line to pass the next level. ☆ tips: Complete the game as soon as possible to get max bonus score. ☆ every match from 3 jewels you will accumulate energy for mighty bomb, that helps to destroy obstacles for you. 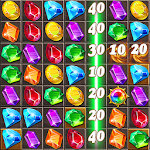 ☆ match 4 can win the jewel bomb and 1 lighting. ☆ match 5 can win color-changing jewel and 2 lightings. ☆ the bomb can eliminate the jewels around. ☆ the timing can extend the playing time. 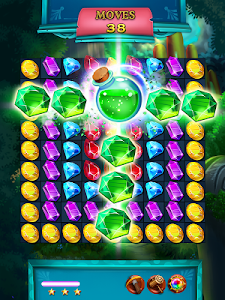 ☆ the lightning jewel can eliminate all jewels in one row or column. ☆ outstanding graphics and music, easy to play, hard to stop playing. Let’s download and share jewels star: OZ adventure for fun now! Similar to "Jewels Star: OZ adventure"